You’re working hard to save and invest. This is the time in life where you will make your major investments. Examine concepts and ideas to tend your investments and set you up for retirement. Now is the time to let your investments take care of you. Income planning, re-location, and health issues are some of the first considerations. You want to ensure that your beneficiaries are taken care of after you pass. Rest assured that you have taken the necessary steps to help make a smooth transition to your heirs and charitable organizations. America's trusted voice on money and business matters. Featured Article: How BIG is currency? Securities offered through Kestra Investment Services, LLC (Kestra IS), member FINRA/SIPC. Investment Advisory Services offered through Kestra Private Wealth Services, LLC (Kestra PWS). 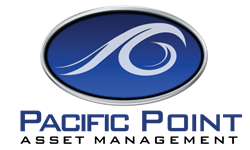 Pacific Point Asset Management is a member firm of Kestra PWS, an affiliate of Kestra IS. Pacific Point Asset Management and Kestra IS are not affiliated. Kestra IS and Kestra PWS do not provide tax or legal advice.